U Aye Hlaing had never tried it before, but after seeing healthy green stalks of ginger shooting up from partially shaded, naturally composted soil at a nearby, pesticide-free ginger demonstration plot, he decided to go “all natural” with his own crop in Ale Chaung Village, southern Shan. He planted an acre of ginger seed, spacing plants widely to give them room to grow; intercropped with maize for partial shade; and used home-made fertilizer with pig manure. U Aye Hlaing stands in his ginger field. His ginger plants are intercropped with maize. 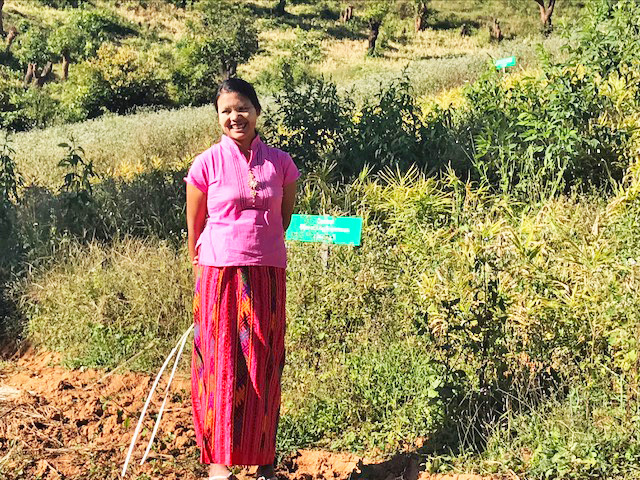 U Aye Hlaing adopted improved practices introduced by USAID’s Value Chains for Rural Development project after observing them at one of 16 ginger demonstration plots established by the project with host farmers around southern Shan. 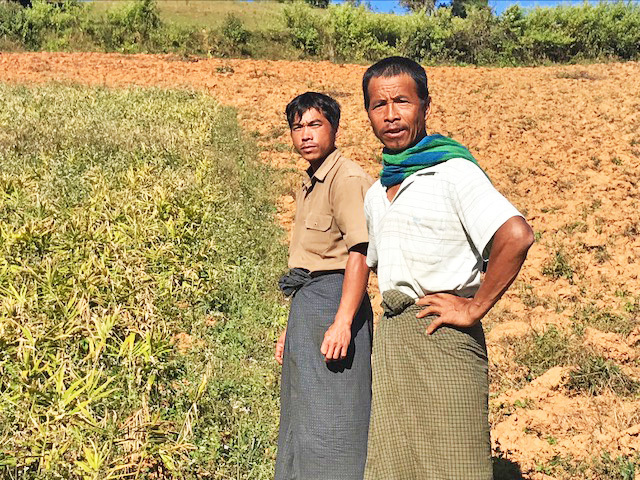 Like other ginger farmers in the region, U Aye Hlaing explained that experimenting with improved practices simply made good sense to him: “Better price for better ginger; healthier for environment and people; lower production costs,” he said. Ginger farmers U Mauag Nyein and U Ba Sein at a demo plot near Kalaw. 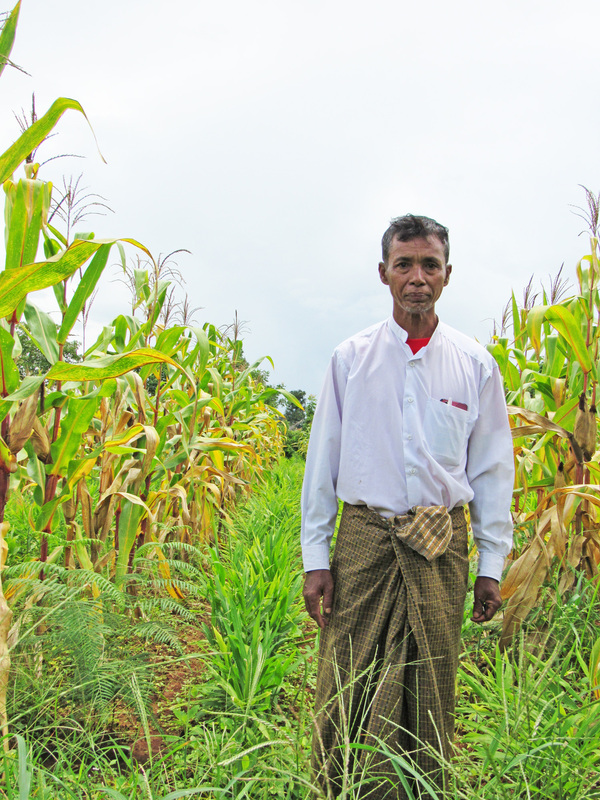 Working with community-based agriculture extension partners, as of January 2018, the Value Chains project had conducted ginger Farmer Field Days at ginger demonstration plots and host farms in Kalaw, Pindaya, Pinlaung, Hopong and Yatsauk townships, enabling 4,250 smallholder farmers to learn from each other, ask questions and observe the results of good agricultural practices such as composting, intercropping, shading, wider spacing, contour planting, and the responsible use of inputs. The activities are helping ginger farmers position themselves with better quality products to meet the demands of new markets, including potential export. In 2017, the project held the first-ever ginger “Business-to-Business” trade marketing event in southern Shan, gathering growers, processors and potential buyers to strategize and build new market linkages, helping farmers find new customers and forge relationships that are strengthening the ginger value chain. Also in 2017, the project shipped the first samples of Shan ginger to interested importers in the U.S., Switzerland and Sri Lanka. 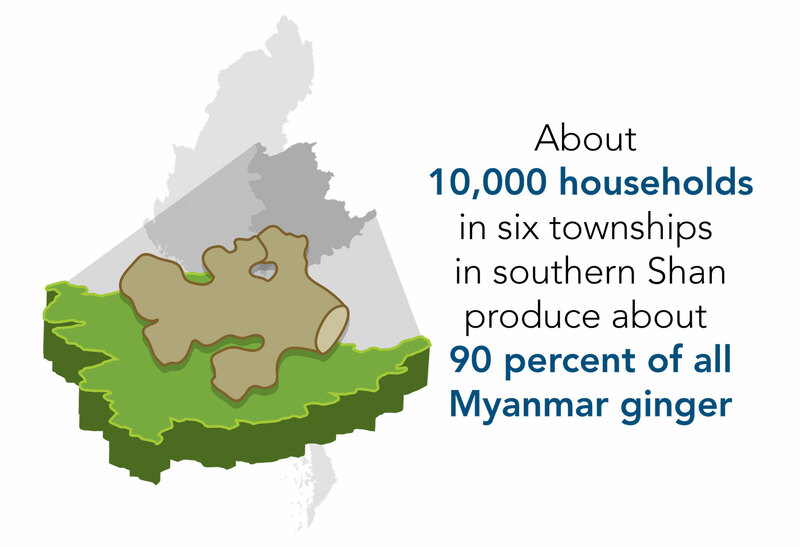 Ginger is one of the main sources of income for about 10,000 households in six townships in southern Shan, which together produce about 90 percent of all Myanmar ginger. The Value Chains project works through community and private sector partners in the ginger value chain to support sustainable, local extension capacity, improve market linkages, and protect human health and the environment. The five-year project also supports coffee, soybean, melon and sesame value chains. It has linked Burmese coffee growers with lucrative international markets, provided more than 42,000 people with agriculture and food security training, supported more than 31,000 rural households through direct project interventions and formed 23 new public-private partnerships in the agriculture sector.